PSNews - Senior Lieutenant General Le Quy Vuong, member of the Party Central Committee, Deputy Minister of Public Security on April 16 attended the monthly meeting of April 2019 with people at the citizen reception office of the Ministry of Public Security (MPS) at No.3, Nguyen Thuong Hien Street, Nguyen Du Ward, Hai Ba Trung District, Hanoi City. PSNews - The Thua Thien Hue Provincial Police Department on April 11 organized the 1st martial arts festival in 2019. Prime Minister Nguyen Xuan Phuc on March 9 presented a Ho Chi Minh Order to the Vietnam Military Medical University (VMMU) in recognition of its outstanding performances in training, scientific research and supplying health care services to soldiers and people. PSNews - The Women's Union chapter of the Ministry of Public Security’s Department for Information and Communications on March 7th held a conference on the occasion of the International Women's Day (March 8th) to review its working results in 2018 and roll out working plans for 2019. The Ministry of Industry and Trade on March 5 revealed a scheme on increasing the average retail electricity tariff by 8.36 per cent in late March. 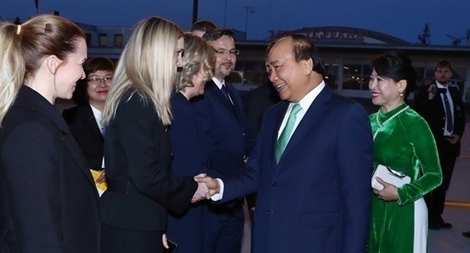 The official friendly visit to Laos from February 24-25 by Vietnamese Party General Secretary and President Nguyen Phu Trong is expected to contribute to tightening, enhancing and developing the traditional friendship, special solidarity and comprehensive cooperation between the two countries, a Lao official has said. PSNews - The traditional ritual of bringing home fire from the temple in the Lunar New Year has been maintained in An Dinh village for many years as people believe that the fire they get from burning votive papers at the village temple would bring luck to their families. A range of five-star hotels in Hanoi have been fully booked ahead of the US-North Korea Summit which is scheduled to take place in the capital city. Vietnam has great potential for the development of information and communications technology, which is considered a key pillar for the government in the development of a digital economy. The Hanoi City People’s Committee announced a decision to establish a steering committee on building the municipal e-government on February 15. PSNews - The Traffic Police Department under the Ministry of Public Security on January 21 and Honda Vietnam Company (HVN) signed a coordination program to conduct traffic safety activities in the period of 2019-2021. PSNews - The Binh An Ward Police Team, District 2, Ho Chi Minh City (HCMC) on January 6 deployed a working group to residential area No.4 of Binh An Ward to receive temporary resident applications and return temporary residence permits to people in accordance with the Residence Law. PSNews - The Nature Education Center will be a useful learning facility for over 3,000 students in Da Nang City and people living in neighboring areas, as well as domestic and international visitors to Da Nang.